A new award for a TexSelect designer working with wool for interiors has been created by the Worshipful Company of Woolmen. Roger Tredre explains all. Andrew Dawson, Master of the Worshipful Company of Woolmen, comes alive when we walk into the yarn store at London’s Central Saint Martins. Straight away, he’s examining the quality of the wool yarns, foraging and unpacking, discussing prices, unravelling a roll of wool tops. This is the universe he’s known all his life – the world of greasy wool and scoured wool, of wool tops and noils. As the grandson of Harry Dawson, who first sailed from Yorkshire to Australia in 1887 on a wool-buying mission, Andrew is wool royalty through and through. Aged six years old, he was bouncing up and down on greasy wool in the sorting rooms. Many decades on, he can still recall the atmosphere in the wool warehouses, the very smell of the wool. As a young man, he did his apprenticeship sorting wool at Lord Barnby’s Airedale Combing Company in Shipley, near Bradford, and spent 18 months broadening his knowledge in Biella, Italy, no less. His company H. Dawson Wool, his grandfather’s creation, based in Bradford to this day, has been his life. 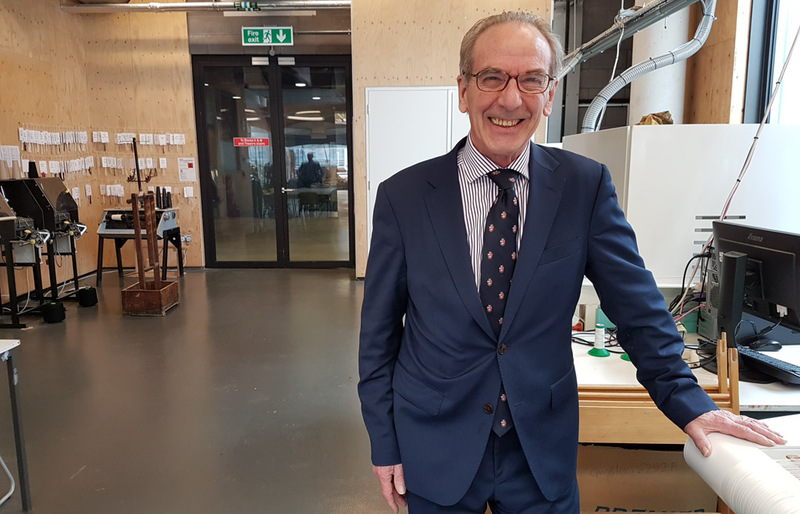 Dawson may have formally retired from all that, but in April he became Master Woolman and is overseeing the launch of The Worshipful Company of Woolmen Design Innovation Award for Wool in Interiors. The creation of this £1,000 award is a highlight of 2018 for TexSelect. Judging takes place in London on July 3, with the winner (who must use at least 70% wool) announced to the international textiles industry at Première Vision in September. 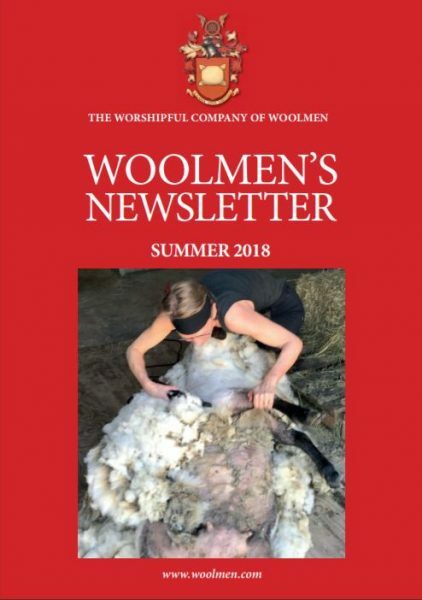 Separately, the Woolmen are a Major Sponsor of TexSelect, providing important support for its busy calendar of activities. Although historic livery companies such as the Worshipful Company of Woolmen are well known within the City of London, outside the financial district their work is under-appreciated and even misunderstood. Christopher Thierry, who was Master until April this year, points out that the liveries collectively, alongwith the City of London Corporation, are the third biggest provider of charity in the UK. All the work is voluntary, with members supporting a vast number of charitable causes across the country, mostly related to their historic craft or trade. And, it should be emphasised, there are plenty of women among the Woolmen. Contrary to popular opinion, the livery companies are not rolling in money. The Woolmen’s annual Sheep Drive across London Bridge and Wool Fair at Monument raises a substantial share of the funds for its Charitable Trust. 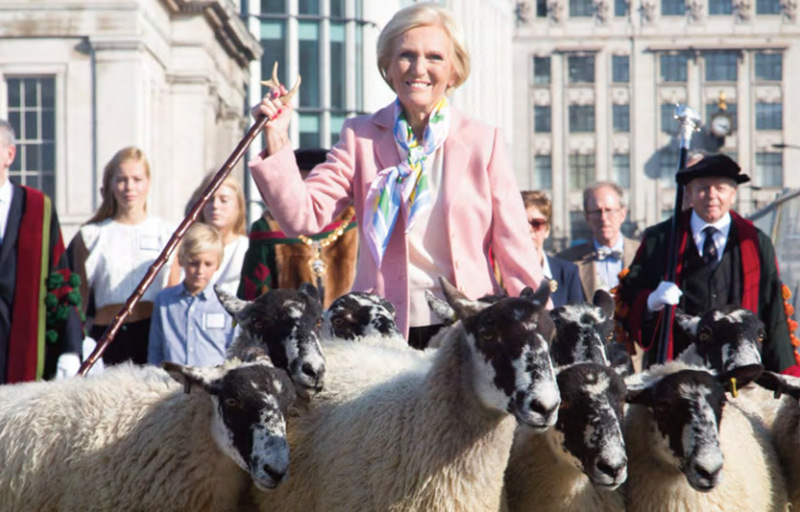 At last year’s Sheep Drive, Great British Bake Off star Mary Berry joined 600 other Freemen who drove sheep back and forth across the bridge in relays, exercising their ancient right, and raising over £36,000 for charity in the process. Every pound raised is spent with care and thought. The Woolmen hope that by tapping into TexSelect’s expertise and network of creative excellence, its sponsorship contribution will be used to maximum effect. Rewind way, way back to the 12thcentury and the Worshipful Company of Woolmen were a powerful presence in the land, overseeing the wool packers and wool merchants to ensure a consistent quality. It could be said that the Woolmen built the wealth of Britain. Thierry, like Dawson, has wool running through his life story, with 20 years of marketing merino wool for The Woolmark Company (as well as long spells with retailers such as Allders, Topman and Owen Owen). “We forget that wool has historically been a luxury fibre,” he says. “We need to treat it with the respect it deserves. If we invented it today, it would be the greatest textile invention on the planet.” Andrew Dawson chips in approvingly: “Synthetic fibres get tired. Wool doesn’t get tired”. Thierry also notes that synthetics add to ocean pollution as fine particles fall away every time a garment is washed. Dawson and Thierry hope that they’ll be able to support the designer who wins the new award beyond the pure financial, with guidance and mentorship based on their collective decades in the business. The winner will also receive the award at the Civic Dinner in October in the presence of the Lord Mayor of the City of London and Sheriffs,an event that will be held in one of the City’s great halls. As the Woolmen’s fine Latin motto puts it, Lana Spes Nostra – Wool Is Our Hope.